It was with some anticipation that I headed out the door to go to the Gettysburg Toy Soldier Show. The 'burg is only about 45 minutes from home, an easy and scenic drive over Catoctin mountain - and past Camp David no less. I arrived at the Eisenhower Conference Center and no sooner had I walked in the front door than the power went out. People ended up being lost in pitch-black restrooms, extricated from elevators, and wandering around in a state of bewilderment. 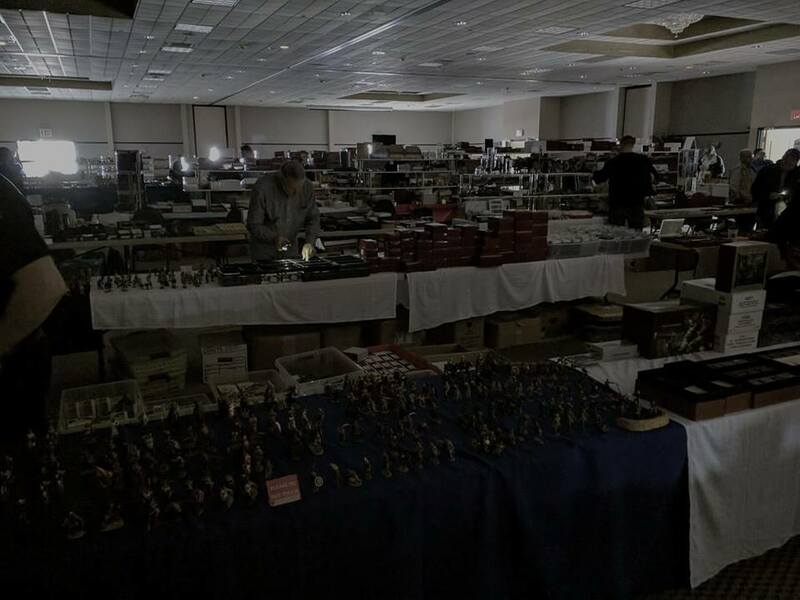 Inside the big room, forlorn dealers were desperately trying to conduct business in the gloom. The only light was coming from the propped-open exit doors and the light from the flashlights of the patrons phones. I heard more than one vendor lamenting the fact that he wasn't even going to make back his table fee. It was from one of these unfortunates that I made a charity purchases. Although the darkness prevented me from finding all of the bargains nonetheless I found a few which I share here. From a very congenial collector/dealer named Michael I acquired, for a neat bargain, three Imrie/Risley items; an ACW caisson and two limbers. Used, with a very small amount of wear, they're going to look really great for the next artillery duel on the toy soldier table. The pair of limbers is equally nice. The lids come off to show the projectiles inside. Also from Michael, an again at a bargain price, I got this nice little Britains howitzer. From one of the dealers who was afraid he wasn't going to make back his table fee, I bought this nifty little semi-flat heavy cruiser. Every little bit helps, even six dollars at a time. I picked up an original MARX General Grant, only to get home and find that I always have one. Well, I guess that when you're in a tight spot on the 54mm battlefield, there's no such thing a too many Grants. My triumph was the 1/16 Lindberg ACW horse-drawn limber and six-pounder gun. The dealer was eager to sell and the price reflected his mood. Today, I took a break from yard work and spent not quite two hours assembling the gun. Flash-free and beautifully injection molded, the detail was excellent and the fit was perfect. This is going to be a major undertaking as all of the tack and harness for the four horses is incredibly involved and detailed. The assembly and painting of this kit is going to take a very long time. The gun I put together specifically for this blog post. Otherwise, I'll be setting this project aside until, perhaps next winter. The kit purports itself to be 1/16, but it's much closer to a robust 1/12 scale. Well, as you see, I picked up some pretty nice items. If you're in the area next April I'd recommend that you check out this show. And while you're out here, come over to my side of the mountain for a tour of the toy soldier table.